Light Output Light output requirements differ for different categories, based on the incumbent incandescent bulbs. Most requirements are measured in lumens, but PAR, MR and MRX bulbs have requirements in center beam candlepower based on equivalency claim and beam angle. 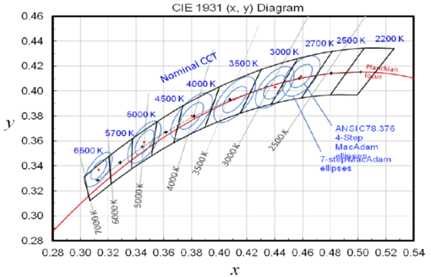 Color Maintenance The change in chromaticity coordinates from 0-hour measurement, at any measurement point required by the specification or reference test method during operation, shall be within a total linear distance of 0.007 on the CIE 1976 (u’v’) diagram. Color Quality (Color Rendering Index or CRI) CRI ≥ 80 and R9 > 0 for LED bulbs. Color Angular Uniformity Variation of chromaticity across the beam angle of the bulb shall be within a total linear distance of 0.006 from the weighted average point on the CIE 1976 (u’v’) diagram. Lumen Maintenance CFLs: Bulb shall maintain ≥ 90% of initial lumen output at 1000-hours; and ≥ 80% of initial lumen output at 40% of rated life. LED: Bulb shall maintain minimum percentage of 0-hour light output after completion of the 6000-hr test duration, ranging from 86.7% - 95.8% depending on the claimed lifetime of the bulb. Bulb Life Minimum life rating of 10,000 hours for CFLs, 15,000 for omnidirectional and decorative LED, and 25,000 for directional LED bulbs. Dimming Bulbs that claim to dim must test the bulbs for maximum and minimum light output on a dimmer, as well as, flicker and noise, and must dim to 20% or lower. Warranty Minimum warranty period of 2 years for bulbs with a life rating of < 15,000 hours, and minimum 3 year warranty for bulbs with a life rating ≥ 15,000. Allowable Base Types The scope is limited to bulbs with integrated ballasts and drivers intended to be connected to the electric power grid with the following ANSI standard base types: E26, E26d, E17, E11, E12, G4, G9, GU10, GU24, GU5.3, and GX5.3. Start Time Bulb must start and remain continuously illuminated within 750 milliseconds of application of electrical power. Run-Up Time CFL bulbs must reach 80% stabilized light output in ≤45 seconds. ≥ 0.6 for Omnidirectional LED bulbs with input power ≤ 10 watts. ≥ 0.7 for all other LED bulbs. Rapid Cycle Stress Test CFL bulbs are required to undergo a test to stress the electronics and/or cathodes of a bulb with up to 15,000 on/off power cycles. Dimensional Requirements Bulb shall comply with American National Standards Institute shape standards minimum overall length, maximum length and maximum lamp diameter values, where they exist. Elevated Temperature Testing Bulbs intended for use in recessed or enclosed fixtures are required to undergo elevated temperature life testing inside a recessed can or testing apparatus held at 45°C or 55°C to simulate restricted airflow in such luminaires.